During the month of February, 2014 alone three Christian churches on Zanzibar were targeted by Islamic extremists. On February 15th, a bomb exploded at the entrance to the Seventh Day Adventist Church and a second bomb was thrown into the same entrance the very next day. Another bombing took place at the entrance to the Evangelical Assemblies of God Church on February 23rd- only eight days later. While the very next afternoon, two bombs exploded at the entrance to Christ’s Church, the Anglican Cathedral located in Stone Town as well as at Mercury’s Seafood Restaurant a popular tourist destination also located in the historic center of Zanzibar City. These were only the latest in a host of bombings and burnings committed against Christians throughout the city. In January 2014, a bomb exploded outside a Zanzibar mosque in Stone Town killing one person and wounding seven after a handmade explosive device was thrown from a car as worshippers left the mosque. A cleric visiting from the mainland had preached a sermon that morning urging all Muslims to remain peaceful in spite of the Jihadi’s use of violence to achieve their aims. Two Catholic priests were victims of shootings; the first severely wounded on Christmas Day, 2012 just after he’d arrived home. Then again on February 17, 2013 a second Catholic priest was shot and killed. On September 13, 2013 an acid attack occurred on a Catholic priest in the outskirts of Zanzibar City. Uamsho, a well- known separatist organization on the island, has been identified by the police as the movement behind the bombings and shootings after sending out written messages threatening to do just that- even naming the churches that would be targeted. The Association for Islamic Mobilization and Propagation or Uamsho as it has aptly named itself literally means “The Awakening” in Swahili. It began as a religious charity for Muslims then morphed into a Separatist movement shortly after the 1964 union with Tanzania. The goal of Uamsho since 2010 was and is to organize the islands in Zanzibar Archipelago into one Muslim country bound by Sharia Law. It resents the agreement made with Tanzania in 1964 just after it had been declared a constitutional monarchy by Britain and seeks to become its own autonomous country in union with Tanzania in the same way the countries in Europe have come together as equal members in the European Union. It also wants to impose a “public code of conduct” on all tourists visiting the islands in regards to their dress and the public consumption of alcohol. It has also suggested that all “wabara” or mainlanders originally from the continent of Africa and now living in Zanzibar lose their status as residents and be deported. 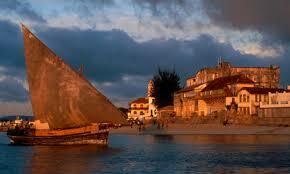 Zanzibar is an archipelago or collection of islands. There are two main islands Unguja, the main island where Zanzibar City is located and Pemba, which encompasses the smaller islands. Seeing that 97-98% of the population living in the Zanzibar Archipelago are Muslims and follow the teachings of the Qu`ran the goals of Uamsho make sense to them which has made it a very popular organization among the local citizenry. When Uamsho’s leader Sheikh Fared Hadi Ahmed suddenly went missing in October, 2012 two days of the worse riots ever experienced in Zanzibar’s history erupted over his possible abduction. Shiekh Hadi has since been located and arrested along with ten other Muslim clerics all charged with criminal conspiracy as well as the instigation of violence. Uamsho is also very popular with other wealthy Arab nations like Saudi Arabia and Iran who openly fund the movement. The Serena Hotel in Stonetown is owned by his highness the Aga Kahn IV, Imam of the Shia Imami Islami Muslims and direct descendent of the prophet Mohammed. While Saudi Arabia invests more than one million dollars each year in supporting Islamic Universities, madrasas, and providing scholarships for Zanzibar’s young men to study in Mecca. It seems that Uamsho’s rhetoric appeals to a certain type of youth especially the unemployed or under-employed. Unfortunately although Muslims make up the largest population living on the islands; more than 1/3 of them live in dire poverty while even those with jobs exist on less than one US dollar a day. According to Zanzibar’s 2012 employment statistics 80% of men less than thirty years of age are currently unemployed. And the country of Somalia is only 300 miles away from Zanzibar by boat making it an easy trip. Al- Shabaab knows this and has begun to entice disenfranchised males from Zanzibar in the same way they recruit young Kenyan boys from Mombasa. Tourism on Zanzibar generates well over 500 million dollars (US) annually but few local residents ever benefit from these profits. European firms especially those from Italy have invested heavily in Zanzibar’s resort hotels but these large chains recruit their staff from the East African mainland especially Kenya instead of selecting local residents to assume well- paying positions. These same hotels pay the Tanzanian government in Dar es Salaam enormous sums of money in taxes yet little of these funds find their way back to the poor of Zanzibar leaving large numbers of unemployed youth free to wander the streets with little chance of advancement and less chance of making a good marriage. In the end these are the type of young men Islamic extremists prey upon because it is the angry and disgruntled ones who’ll throw the bombs and fire their AK-47’s on command. It is young men exactly like these who are responsible for throwing acid and tossing bombs around Stonetown lately. As al- Shabaab and its larger affiliate al-Qaeda continue to lose respect in Middle Eastern Countries they have moved south looking for newer targets; places where Muslims have demonstrated discontent with the status quo. According to a 2012 Pew Research Center Survey conducted in Egypt, Jordan, Lebanon, Pakistan, and Turkey the majority of Muslims surveyed had an unfavorable view of al- Qaeda one year after Osama bin Laden’s death. In Pakistan alone, a good 55%, over half, rated al- Qaeda unfavorably. “Typically when people, are exposed to extremist violence in their own country we tend to see them reacting negatively to it,’ stated Richard Wike, associate director of Pew’s Global Attitudes Project. But to better under Zanzibar’s separatist views and current opposition to its relationship with mainland Tanzania one only has to examine its rich and colorful history. Because of its prime location out in the Indian Ocean some thirty miles from mainland Africa it was an ideal place on which to establish a center dedicated to trade and commerce. Early on Persians, Arabs, and Indians did just that turning it into a base of operations for their ships as well as their merchants. By 1503, European naval powers became aware of its existence and it was subsequently claimed by Portugal and made part of its Empire. Portugal continued to maintain a loose form of control upon these islands for the next two centuries. In 1631 the Sultan of Mombasa, an island kingdom located off the coast of Kenya massacred all of the European inhabitants living there which sent the Portuguese administrators on Zanzibar into a panic. They decided to use someone better acquainted with Zanzibar to rule it and invited the Sultan of Oman, one of the smaller countries that borders Saudi Arabia and is located at the mouth of the Persian Gulf. Said Bin Sultan was a great ruler who not only controlled Zanzibar but added a good portion of the Swahili coast from lower Kenya to current day Tanzania to his administrative territory. He established a lucrative slave and ivory trade on the island sending large expeditions into East and Central Africa as far away as the Congo in search of tribes willing to sell human beings. The newly-purchased slaves then carried the heavy tusks of ivory back with them to Zanzibar. In 1840 Sultan Said made Zanzibar his capital city rather than the city of Muscat in Oman. He also oversaw the creation of large plantations on which a range of expensive spices such as cloves, cinnamon, and black pepper were grown. These plantations were owned and run by Arab families loyal to the Sultan. Eventually this small, elite group helped him rule the island. The great Sultan Said Bin continued to rule Oman as well as Zanzibar up until his death when his two sons replaced him. By 1822 British naval ships had entered Zanzibar Harbor seeking to end the slave trade and close down all slave markets on Unjuga for good. This was no easy task but by 1842 the British were well on their way to seeing their mission completed. By 1890 Zanzibar had been made a British protectorate rather than a colony of Great Britain. From 1890 until 1913 Arab viziers were assigned by the British to govern in their name but starting in 1913 until 1963 British diplomats were appointed to serve as the island’s governors. The islands of the Zanzibar Archipelago gained their independence from Britain on December 20th 1963 and for a very short time existed as a constitutional monarchy. And then the Zanzibar Revolution erupted without warning. On the night of January 12th, 1964 John Okello, along with 600 – 800 men many of whom were dock workers affiliated with the island’s Afro- Shirazi Party ( ASP) and with ties to other countries in East Africa stormed the local police stations, subdued the policemen there, confiscated all weapons stored in the local armories, then headed out to the government building to remove the current Sultan of Zanzibar and his Arab advisors from power. The Sultan and his minions had already left the city on his yacht. Some of the rebels quickly took control the local radio station while others searched for people of Arab and Asian descent. These were hunted down and dragged from shops and homes then beaten and shot dead in the streets. Hundreds died during the chaos of that night while thousands more escaped from harm by setting off into the Indian Ocean on their boats. After only twelve hours of fighting the rebels controlled the central government of Zanzibar. Okello, originally a citizen of Uganda, came to the island seeking employment and found a position as a dock worker. He joined the local Afro- Shirazi Party and soon served as its branch secretary. Okello believed he had been appointed by God to break the control of the Arab/ Asian ruling class living on the island because Zanzibar rightfully belonged to Bantu Africans. Okello installed Abeid Karume, leader of the Afro-Shirazi Party, as the first President of the new country of Zanzibar. Then Okello gave himself the tile “Field Marshall” and along with his rebels continued to attack any Arabs and Asians still in residence on the islands. He then organized his revolutionaries into the Freedom Military Force and used them to patrol the streets confiscating all Arab and Asian properties on behalf of the newly- formed government. Okello believed that Zanzibar needed the support of their Bantu African allies in Tanganyika in order to remain free from Arab control so signed an agreement of confederation with this country at the first opportunity. But Okello’s reign was short- lived and by March 11th, 1964 President Karume had stripped him of his title and seen to it that he could never enter Zanzibar again. Okello was deported to Tanzania then Kenya finally returning to his own country of Uganda where he died a broken man. On April 26th, 1964 the Zanzibar Republic merged with mainland Tanganyika to form the United Republic of Tanzania with Zanzibar designated as its own semi- autonomous region. Residents of Zanzibar bristle at the mention of this agreement and the idea of a separate country of Zanzibar appeals to many. The current population of Zanzibar is about a million strong and pulls from a wide range of diverse ancestries causing ethnic tensions to simmer just beneath the surface. After Sultan Said established his capital on Zanzibar around 1940, a small group of Omani Arabs, friends of the Sultan were lured to the island with promises of great wealth. These families eventually came together to form an elite class of plantation owners and administrators who helped the Sultan rule the island while traders from India formed their own exclusive brotherhood of merchants. Although many Arabs and Asians fled during the revolution many returned once Okello had been removed and Zanzibar had been joined to Tanzania. Even on the eve of Zanzibar’s independence Arabs accounted for less than 20% of the island’s total population yet were some of its wealthiest residents who served in government positions of great power. Other residents of Zanzibar had not fared so well. These came from the mainland, Bantu Africans, descendants of the freed slaves who’d once been forced to work the plantations. And a special group known as the Shirazi, an ethnic group formed as a result of intermarriages between Bantu Africans and Persians were some of the earliest peoples to settle the islands. Many residents still feel the way Okello did, that Zanzibar should be the exclusive domain of Bantu Africans and Shirazi – not Arabs and Indians who have their own countries in which to reside. But what has brought Zanzibar’s mixed population together in the past is its choice of religion and what is holding it together now is its religion as well. An estimated 97-98% of all islanders are Muslims and are not terrorists. It would be very easy for Muslims to stage a revolt and oust all Christians from the islands and is a testament to their remarkable tolerance that they have not. The majority of local Muslims on Zanzibar have shown great restraint and not bought into the terrorist rhetoric spread by al- Qaeda representatives visiting from Kenya. And those young men, the ones who do join al- Shabaab; the ones looking to vent their anger on someone else; they could just as easily be guided in a more favorable direction. If they were provided with the training needed to qualify them for lucrative jobs that would give them a chance to make desirable marriages; this would go a long way in quelling their destructive temperaments. It’s time the large hotels came together and joined with the government of Tanzania to tackle the unemployment crisis on Zanzibar. Wide scale employment could very well be an acceptable antidote to increasing acts of terrorism. ← Massacre in Mpeketoni: “Pwani Si Kenya”, Political Retribution, or Terrorism?